I was really upset to hear about Leonard Nimoy’s passing yesterday — I grew up watching Star Trek. A lot of you asked in the comments from yesterday if we thought he’d get an in game tribute. Well, technically he already has one, and it’s been there since vanilla, down in Gnomeregan. Of course, he should be wearing a blue shirt and not a red one — I mean come on, everyone knows Spock’s always been a science officer and blue has been for science and medical since the beginning and yes I am a gigantic nerd thank you. Let’s get to some Warcraft questions. Q4tQ: Two Birds Enter: Pepe v. Percy deathmatch. Who wins? I’m pretty sure Percy and Pepe would be pals, and probably team up against whoever dared try to make them battle each other in the first place. And then they’d go find horrible fan fiction to read afterwards. Q1: Where do you get the recipes for the new food in 6.1? Q2: I remember they were implementing a way for you to buy the followers you missed from the branching garrison questlines in the leveling zones. Disturbing subtext of buying sentient beings aside, where is this vendor? 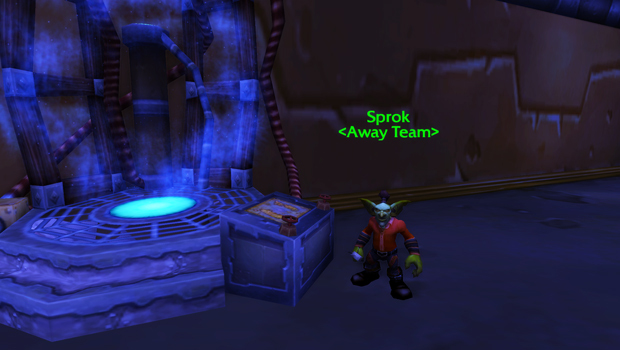 New food recipes can be purchased from vendors in your garrison — for Horde, that’s Kraank, for Alliance, that’s Arsenio Zerep. As for the followers, the vendor to purchase additional followers you might have missed should be right there in your Town Hall. I know on Horde players, it’s a tauren located right behind the mission table — I’m assuming the Alliance vendor is in the same general area. The Legendary ring doesn’t swap for specs — however, you can purchase the ring for your other spec if you really want to. Q4tQ: Any chance that we will see a Cata-style revamp of Outlands, Northrend? This would include redoing the 60-70, 70-80 experiences. I want to level characters but after the Cata and beyond advances in storytelling, its hard to go back. No. In order to roll out the revamp of classic content, they had to build an expansion around it, because there was just that much material to cover. And although the revamped quests are wonderful, there was never really a mad scramble to level from 1-85 and play through all that content they’d just spent all that time revamping. I don’t really see them doing that with any of the other material. Q4tQ: How much of Warcraft’s massive backstory do you think should be shoehorned into the movie? A lot of us here will know why the orcs are attacking and why Medivh opened the portal on Azeroth, but most of the movie’s audience will have no idea. How would you quickly and concisely explain that these characters aren’t doing what they’re doing just for the sheer, cussed thrill of it? You take the elements that are most vital to the plot and include those, while ignoring the rest. Yes, there is a lot of detailed elements to Warcraft‘s backstory, but not all of those elements really translate to film, or need to be on film in order to tell a good story. That is the boiled-down heart of what the formula for a story should look like. The names may change, the events might change, but the essence remains the same — it’s a simple step by step progression that, when followed, almost guarantees your movie or your story is never going to go off the rails and get sidetracked by incidental side stuff. That’s pretty much what Blizzard and Legendary have to surmount with the movie — allowing the story to be told without going off on one of the million different incidental tangents that make perfect sense in the context of a game, but just distract from what should be an A to Z story in a film. I think they’ve got a handle on it. Q4tQ: You get a lot of XP now for having followers in their buildings from work orders. Is there any XP for them being in the mine or herb garden? I believe so, yes. Every time you complete a work order, your follower gains experience. Since the mine and the herb garden both have work orders that can be completed, it stands to reason they should also give experience to followers that are assigned to the building.